If you need to take care of an Owner action, get started by clicking Adminland on Adminland in the top right. Need to see what Projects have been created without you? Or need to get access to a Team you weren't added to? As an account owner, you can add yourself to any Team or Project, any time. Oops, got a typo in your account name? Or maybe you're rebranding? Either way, you can change your account name anytime. Click into Adminland, and scroll down until you see Owner actions and the option to rename the account. Changing this name will also change the name of your Company HQ. 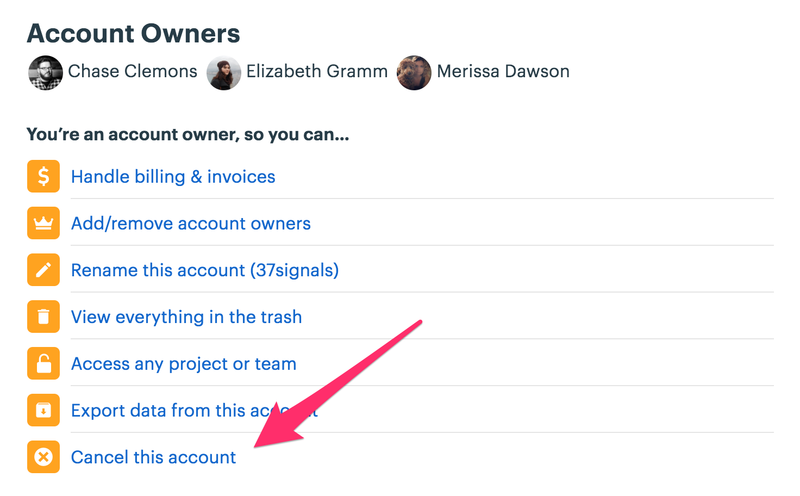 As an account owner, you can view everything that's been put in the trash - across all Projects and Teams in the account. This is helpful for owners to see an overview of what's been deleted and gives you an opportunity to recover anything that you want to keep. Once you click that, you'll see an account wide overview of everything that's been trashed. This is ordered by date - oldest to newly trashed. If you'd like to restore the trashed item, click on it and you will be given the option to view it, restore it or go to the trash to permanently delete it. If you're sure you'd like to cancel your account, we'll be so sorry to see you go! Canceling takes effect immediately — you won't be charged again, and your account will be inaccessible. For security's sake, your data will be permanently deleted after 30 days. If you need to get back into your account before then, shoot us an email. We can help! If the current owner of your account isn't available, read our account ownership policy.